Mentholatum Ointment Review – Is This Product Safe To Use? Mentholatum ointment is a topical analgesic supplement that is used in the joint care industry. According to the manufacturer, Mentholatum ointment is made in such a way that it dissolves quickly and offer pain relief within the first 10 minutes. The company markets this product to sports people and people who are suffering from aging joints and muscles. What is the Company Behind Mentholatum ointment? What are the Ingredients Used in Mentholatum ointment? How Does Mentholatum ointment Work? What are the Pros of Mentholatum ointment? What are the Cons of Mentholatum ointment? How should you use Mentholatum ointment? 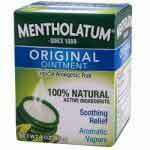 Mentholatum ointment can be bought over the counter without a prescription. The official website sells it for $6.99 per oz. The final price may vary depending on the shipping and handling costs. Mentholatum ointment is a topical cream that is used to soothe joint aches and promote the soothing of sore muscles. The ointment is meant to be applied directly on the affected region for the pain soothing to happen. Mentholatum ointment is recommended when you have sore muscles and aching joints perhaps due to physical activities or ailments. It is made by a company known as Mentholatum. This is a company that is known for producing an assortment of healthy supplements ranging from skincare to joint care. They claim to invest a lot in terms of research, and clinical studies. Camphor – This is a pain soothing ingredient that is common in topical analgesics. It is in fact the ingredient that gives the supplements the characteristic smell, it is known to have high anti-inflammation effects and pain soothing abilities. It is topically applied directly on the affected area. When it is applied, it takes a few minutes to dissolve into the skin. Once in the body, it acts on the affected area by first calming the inflammation and then intercepting the pain signals being sent to the brain. Since the pain relief happens on the nerve endings, it can be in a position to stop the pain in different joints of the body. The healing effects delivered are not permanent. You need to apply the ointment again after some time in order to realize sustained benefits. To use this product, clean the affected area with warm water and pat with a towel to dry. Then apply a small scoop on your hand and massage the affected area until all the ointment has dissolved into the skin. Do this for not more than six times daily on the same spot. It is a simple topical analgesic that promises a lot. Top of its marketing claims is that the ointment works within the first ten minutes. We like the fact that it is available to be bought and shipped all over the world. The choice of the ingredient is also great and we feel that this product is competitive. However, there are many topical joint pain products available in the market which are available at cheaper prices. Explore them before ordering this product.